Peter Golds, the leader of the Tory group on Tower Hamlets council, has today written a very interesting letter to Mayor Lutfur Rahman in response to his call for the police to investigate allegations of homophobia and racism. In his letter, he highlights a significant controversy that has been bubbling in the background for some months now. In the six years I’ve covered Tower Hamlets politics I’ve seen the Conservative group being accused in the council chamber of racism several times. Sometimes it would have been by Labour councillors (led by some now on Lutfur’s benches) and at other times it was by Respect (led by some who are now on Lutfur’s benches). The gist was the Tories were racist because they did not have any Bengali councillors in their number. These accusations always seemed more than a bit cheap, not least because good Bengali candidates were being fielded in elections but the votes went elsewhere. One of those who used to make such smears was Ohid Ahmed, who of course is Lutfur’s frequently incomprehensible deputy executive mayor. Well, it seems as though he’s been playing the race card again. In Peter’s letter, which is copied below, it emerges that during a council debate on whether to make changes to the constitution last November (so that Lutfur would be required to answer questions), an angry Ohid pointed at the Tories and seemed to imply that Lutfur was being targeted because he was Bengali. This seems to be the basic tactic of the Lutfurites: they are putting the myth out there that there is a witch-hunt against Bengalis and Muslims. So much for the One Tower Hamlets rhetoric. Two months after Ohid’s apparently nasty little tantrum, he delivered a three-line letter to Peter Golds in what amounted to a qualified apology. A more detailed explanation was sent to Cllr Golds by Lutfur’s bizarrely slavish monitoring officer, Isabella Freeman. However, we are forbidden from knowing the contents of that letter (and Ohid’s defence) because it was marked confidential. I suspect that under the Nolan principles of accountability and transparency for those in public life, Ms Freeman’s decision may well be a touch questionable. I think that under those principles, we need to be told. Peter is now demanding a full and unqualified apology from Ohid and that if one is not forthcoming he should resign. I was interested to read your blog about council meetings here in Tower Hamlets and that you are calling the police to investigate the “homophobia” that has taken place at meetings. May I thank you for stating that although you disagree with my political stance you respect my tenacity and conviction. This borough would be far better governed if you could persuade those who support you that we may disagree but ultimately respect each other. The appalling behaviour from your gallery supporters (yes I do receive the text messages sent out claiming to be sent on your behalf, about attending and showing support) and some of your administration which equates questioning policy as something approaching hate crimes does you, the council and the borough no good. However calling the police at this stage regarding the February 23rd 2011 meeting, will not work. Following this appalling meeting, I wrote to the Borough Commander, outlining my concerns in detail. I heard nothing. In May I raised this with the Borough Commander at Overview and Scrutiny and wrote again copying the original letter. I still heard nothing. I approached the former Chief Executive who informed me, staggeringly, that the “police had found difficulty in contacting me”. Eventually I Met the borough commander and we had a useful meeting. An officer was charged with investigating my letter, by which time six months had passed and nothing could be done legally. At the 23rd February meeting I spoke to you in the interval about the abuse emanating from one of your close friends, you waved me away. Cllr Tim Archer raised the chaos with the monitoring officer and suggested the police be called in, only to be told that this would affect the reputation of the council. Another councillor went to a police statement and made a detailed statement of the abuse and name calling, which has remained a statement. In short, as your blog is late in the day no action will be taken about that meeting. That meeting was not the first incident we have seen in this borough, which degrades the political process and affects us all. In 2005, the election campaign waged against Oona King, broke political bounds for sheer malice. I have, so far, missed your condemnation of this threatening campaign against the candidate of the party for where you lived. In 2008 an organisation called Muslims4Ken made a series of false and inflammatory claims against Boris Johnson. It leafleted mosques claiming that Boris had “expressed his hatred against Islam” and also claimed that “he wanted to ban the Koran”. Sadly those who did this remain in your wider circle. The police should have seized the leaflets and prosecuted the publishers under Section 106(1) and 169 Representation of the people Act 1983 and Section 110(6) and (9) of the same Act. The first section covers false statements in attempting to procure support for a candidate and the second regards the imprint, which requires full disclosure of the name and address of the printer and publisher of election leaflets. Should this happen in May of this year I understand that the police will be more vigilant. I know that you have met Boris Johnson, you may disagree with some of his politics, but I am sure that you would join in rejecting those allegations and for police action to be taken should such a leaflet be published again. On election day in May 2010 I was personally subjected to a campaign of vilification that caused commonwealth election observers to complain. Men were placed at the entrance to polling stations and every Bangladeshi voter was stopped and told about my Jewish name and the fact that I share a home with another man. Despite regular complaints from me and the election observers, police officers chose to do nothing and they and the election authorities agreed it was the problem of somebody else and so nothing was done. It would be reassuring for you to inform the police that this behaviour is unacceptable and that those behaving in this fashion should be arrested under existing legislation. In October 2010 we had the infamous mayoral election, for which comment must be reserved whilst there are pending legal cases. Openness indicates that as Executive Mayor, you should “be as open as possible” and by any standard, not withstanding the myth of “Human Rights” you should answer questions from elected representatives about decisions you personally make. Remember your cabinet take no decisions, you have reserved all those powers to yourself and therefore they have no responsibility. In any other authority the leader would have suspended a deputy who made such a statement. This was directed not only to councillors but to the gallery and was an incitement to racial hatred. When Diane Abbott made an unfortunate and foolish tweet, Ed Miliband told her, whilst she was on TV, that she apologise or be sacked. However there was total inaction regarding your deputy, until minutes before the January 25th council meeting when your advisor on boundaries (is he paid £8.39 to advise on the boundary between good and bad behaviour?) handed me a three line letter from Cllr Ahmed. On it was written. “I have already given an explanation for my comments in the last full council meeting. I did not intend to accuse anyone of racism. Of course he not only accused members of racism he pointed at them in full view of the gallery. So what is the “explanation”? This was a rambling statement in a letter from an officer marked private which suggested that Cllr Ahmed was posing a rhetorical question. Of course being marked private and from an officer (not Cllr Ahmed) remains private and unknown to his public supporters. Having got away with this accusation on November 29th, Cllr Ahmed made a similar accusation on January 25th, this time pointing at a different group of councillors. Once again the response was as predicted amongst his friends and supporters in the public gallery. We have now had two successive council meetings where the deputy executive Mayor has accused other members of racism, whilst playing to the public gallery. When the police come, this behaviour, along with other problems will be high on my list of matters that should be investigated and action taken. Incitement to racial hatred is not acceptable, and your deputy should withdraw those statements unconditionally and apologise in public. Until he does you should consider his position. 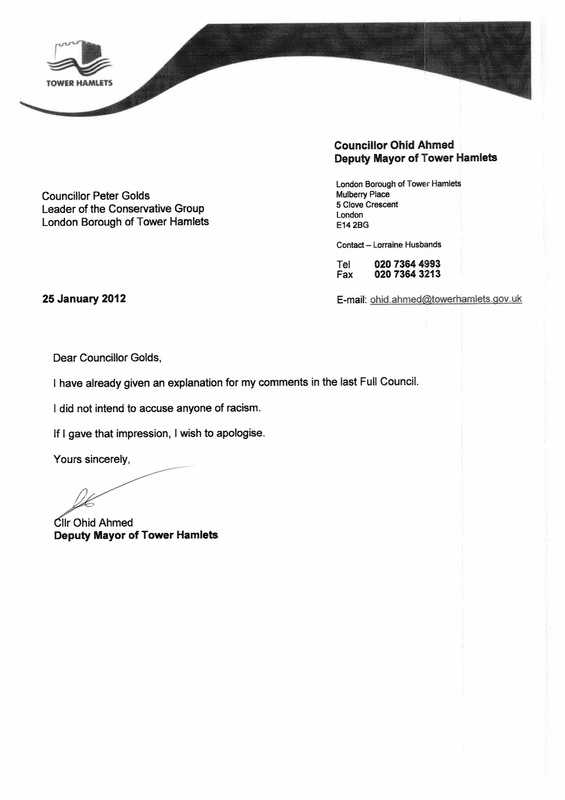 Is Cllr Ahmed aware that “racism” is a two way street and that racist remarks about “white” people is also an offence? Remind me of the ethnic origin of the various members of The Odious Rahman’s cabinet? So far as I’m aware, the Deputy has not made any racist remarks about ‘white people’. I suggest you substantiate your claim or apologise, it is potentially libellous. I suggest you read my comment again. Nowhere did I suggest that he had made any anti-white remarks. It’s not libellous at all. @Newspaniard hasn’t claimed that Cllr Ahmed has been racist, only asked if he is aware of the double edged sword. It’s not a claim. You’re confusing intent with what someone actually wrote. on February 20, 2012 at 6:40 pm You couldn't make it up! Are they also incapable of finding the relevant page on the Council’s website which lists Councillor Gold’s contact details – or contacting the Council and leaving a message asking him to get in touch? How can this happen? WHY did this happen? Elsewhere in the country we have police forces tackling racist chants / remarks on the football terraces and on the football field. The former Captain of the English Football Team is midway through a trial arising out of his alleged racist comments. The explanation of the investigation of what happened will be in full public view. If racist or homophobic accusations are being made to politicians or officers on Council premises then they must be PROPERLY investigated. It is unacceptable for the Council to fail to act. Prior to the phone hacking investigations one would assume that the failure of the Police to act on matters requiring their attention might be down to a shortage of manpower. Following the allegations of bribery and corruption and subsequent arrests one’s actually left wondering whether in fact there might be an alternative explanation…..
Maybe Cllr Golds would do better to approach Scotland Yard rather the local police force? Can I emphasise that the above comments are made within the context of wanting to see both the Monitoring Officer and the Police take appropriate action in relation to ANY politician who is abusive with respect to race or gender preference. This is not a borough where ANY individual should be allowed to get away with being racist or homophobic – no matter what their ethic background, religion, sexual preference or badge of office. Failure to act when it’s your duty to do so is also a racist act (of omission). The ability of the Met Police and the integrity of Rahman’s cabinet can be measured in the same orders of magnitude. Don’t be surprised by failings on either front. on February 21, 2012 at 5:03 pm You couldn't make it up! I am surprised by the fact that they’re taking so long to remedy the failings and to display better standards of behaviour and discharge of their duties. I take great store in the fact that justice usually catches up with all those committing misdemeanours, negligence and outright fraud – eventually. Nobody should think themselves as beyond the law. Pride comes before a fall etc…..
Memories are obviously short and I have to presume that the councillor in question is happy for his previous allegiance to be roundly ignored by his leader and deputy. PS I laughed out loud when I saw the line in today’s blog about somebody objecting to the police being called to the council meeting because it would affect the reputation of the council. on February 21, 2012 at 5:04 pm You couldn't make it up! Now about that Council which has a reputation to lose? Would that possibly be the one with the convicted Member of the Council with a prison sentence who defrauded the Council of housing benefit? Or maybe the one which was proposing to allow bankers to have Christmas festivities at the memorial to the merchants sailors who perished in the last war. Do feel free to add to the list of those acts which characterise the reputation of our illustrious Council……..
Can someone clarify this. Cllr Ohid Ahmed, Deputy ‘Executive’ Mayor? I thought Mayor position is ‘Executive’ as he is directly elected. I thought the Deputy position is appointed rather then elected. you’re right. Duly amended – thanks. He likes to style himself deputy executive mayor but he’s no such thing. Bimol: you’re right. The position is simply ‘Deputy Mayor’, rather than ‘Executive’: just like the ‘Deputy Mayor’ of London. I have serious issues with the politicians, who does not respect electorate or their mandate. As far as i am concern, he is not elected as Deputy Mayor by the electorate. on February 23, 2012 at 2:30 am You couldn't make it up! Cllr Ohid Ahmed really needs to get over himself. Inventing titles for himself like “Executive Deputy Mayor” only serves to give people the idea that he’s both stupid and a pompous prat. “The mayor of Tower Hamlets is Mayor Lutfur Rahman. The Deputy is Councillor Ohid Ahmed. It’s an interesting question though. Does the unelected non-Executive Deputy have any Executive power at all in the Mayor’s absence? All executive functions of the Council are vested in the Mayor. The Mayor may exercise those functions him/herself, or may delegate specified executive functions to be exercised by the Cabinet meeting, a Cabinet committee, an individual Cabinet Member or an officer; or under the provisions of Section 236 of the Local Government and Public Involvement in Health Act 2007 only, by a ward councillor. The Mayor may revoke any such delegations at any time. The Mayor will provide the Monitoring Officer with a list (“the Executive Scheme of Delegation”) setting out who of the following (not specified in the delegations contained in sections 3.2.2 and 3.2.3 above) are responsible for particular Executive functions. If the Mayor amends this Scheme of Delegation the Mayor must provide the Monitoring Officer with an updated scheme within five working days. Ted – maybe you could ask the Monitoring Officer for a copy of the current Scheme of Delegation – and what those specific responsibilities actually involve. PS Cllr Ahmed might also like to decide what he’s going to do about his website – also listed on Facebook – which shows him as being a PPC for the Labour Party for West Suffolk. It also has lots and lots of photos of him with various (former) luminaries in the Labour Party (eg Blair, Brown and the Milliband who didn’t win the election). Or is he keeping his options open? This Monitoring Officer guy? Is it a vacant post? Does he actually do anything? Does he monitor, collect his expenses then go home after a hard day? Does he have any powers other than to operate the coffee machine? He’s not like a party Whip then, keeping everyone in order? He sounds like he’s about as busy, active and effective as the Overview and Scrutiny Committee. full council meetings need to be televised for residents to see what the politicians get up to. Not giving access even though the technology is available is real discrimination. It’s time that the people who go along to these meetings used secret cameras to film the machinations of this chimps’ tea party. Such cameras are available in many forms – hidden inside hats, inside watches, inside specs, inside pens. They cost between £10 and £30. It’s easy enough to upload choice moments from such tea parties to youtube for the world to see how this would-be city is being misgoverned by liars, fascists and fraudsters.